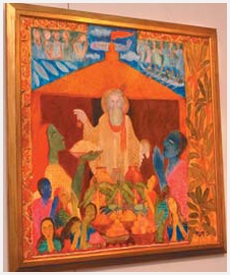 Looking at Radhakrishnan's sculptures makes one think of Alchemy. That was the predecessor of chemistry, when the Alchemist's task was to convert base metals, in his case bronze, into gold. What Radhakrishnan is doing it appears, is to convert metal into air. There is no conjuring in this. No magic wand is used. Instead his figures, stretched in limb to the extent that the bone structure disappears, dancing it seems in the wind, joyous to the ‘nth' degree, are floating in the air with the most tenuous contact with the world in which they, (and we) are supposed to be grounded. We wait for the day when they will not even have that! But from where does this come, this joyousness, this blithe spirit? It has to be rooted in Radhakrishnan himself. Whatever the source of his inspiration, without this childlike quality within him, his sculptures could not soar. The stodginess of the ‘grown up' human being would hold back the free spirit. That he has been able to hold on to this innocence of the child, is in itself, a feat to be commended. To transform that into his work is a gift that we wonder at, and are able to enjoy at the same time. To try and categorise Radhakrishnan's work would be insulting. To attempt to encapsulate talent or genius is to limit the man and his work. But we must look back (and forward) to Masui and Maiya. Masui, a Santhal boy who was a model for Radhakrishnan in Santineketan, has mutated from his human form, lithe, long limbed, smiling, into an idea, a spark to ignite inspiration. He has changed in everyway, except in his lightness of body and of spirit. It is only fitting that Radhakrishnan created for him a Maiya, female, young, oozing a sexuality that she seems not aware of, or, if she is aware, then not bound by it. Instead she complements Masui as much as she is his opposite. Together they are complete, a whole Universe, in their ability to be gods or children, or both, for isn't there a purity in both. Then there are his boxes, and his ramps. Both have moved away from the individual into a portrayal of the world. In his boxes he talks of migration into new cities, new worlds, struggle, an ant-hill of humans with their hopes and failures, their clinging on and falling off. Each separate figure in a child's moulding, each completed piece a work of art, sophisticated in thought as well as in its interpretation. The ramp portrays a Saint, a Rishi, Buddha, still immutable and around him a pygmy world at his feet, continuing with its daily tasks. Or is it a pygmy world dancing the dance of life, worshipful and profane, like all of us. 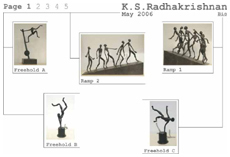 Like a yogi levitating, there is Radhakrishnan and his work. Freeing himself of his earthly base materials, he is stretching his imagination into new heights, different directions, and following them there, is his expertise with his material. And yet, in the necessary business of linking his mind with his hand, of portraying what his mind's eye sees, he is paradoxically doing the opposite of Alchemy – turning an idea into metal.